The Enterprise Server Job Queue page in Enterprise Server 10 shows all Enterprise Server Jobs that are placed in the queue and scheduled to be run. Figure: The Enterprise Server Job Queue page. Step 2. 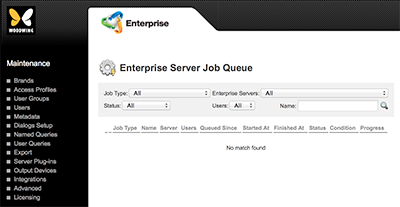 In the Enterprise Server Jobs section, click Job Queue. The Enterprise Server Job Queue page appears.